Google has updated its Google+ app for iOS to add the popular ‘reshare’ feature that lets you pass along interesting Google+ links to your friends right within the app. This is a feature that Google+ users love as they can pass along interesting items to their own circles. Google added this feature to the Android app not too long ago, and now it has come to the iOS version as well. Resharing is easy. Simply tap on a post (like you would to +1 it). At the bottom near the comment box, you’ll see a small arrow. 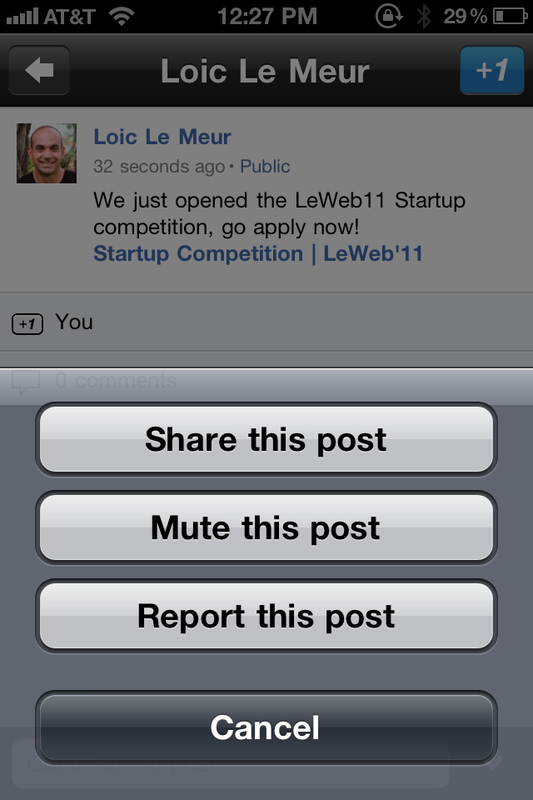 Click it and you’ll see the option to “Share this post”. Just choose your audience, add a comment if you like, and hit “Post”. The reshare feature works in a pretty slick fashion, although it shows up indicated by text in your Google+ feed, rather than the normal ‘nested’ look that you get on the full site. 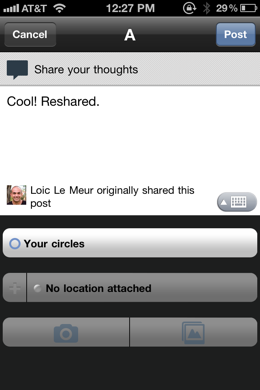 You have the ability to share it with the circle of your choice and to type a message to your followers. This is honestly one of the biggest things that I was missing on the iOS app as a lot of the content I want to share comes from the people that I follow on Google+. 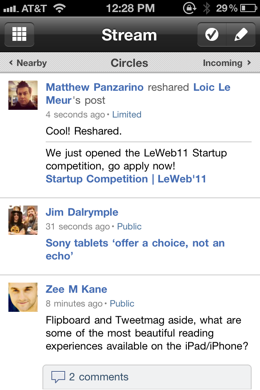 Is this a feature that you’re glad to see come to the iOS version of Google+? If you’d like to follow us on Google+ you can do so by clicking the button below. If you’d like to add me, you can find me here.